The installation of a damp proof membranes is a vital stage in the building process, for both new builds and refurbishment work where a structural DPM may be missing or damaged. 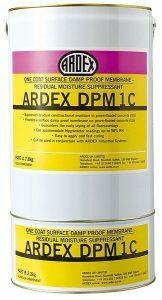 An ARDEX liquid Damp Proof Membrane will protect the floorcovering installation from residual construction moisture and rising damp, where the highest measurable moisture readings are present (up to 98% RH). They also have excellent adhesion to saturated concrete even at lower temperatures making them ideal for tough winter conditions. Where residual construction moisture is an issue on new flooring; ARDEX Moisture Vapour Suppressant will defend against RH values of 95% and allow the rapid laying of smoothing compounds which can be applied in as little as only 2 hours.